When U.S. Sen. Barack Obama won the presidency in 2008, the young Democrat’s victory made history in more ways than one. It not only shattered the color barrier to the highest office in the land, it also heralded social media as a powerful—and powerfully underestimated—strategic tool that aspiring politicians from that day forth would ignore at their peril. Four years later, both President Obama and Republican challenger Mitt Romney maintain a prominent presence on Facebook, Twitter and other social media platforms. And for good reason. Once primarily the domain of tweens, teens and young adults, social media use in recent years has exploded—particularly among those 50 and older—morphing from a casual means of reconnecting with old friends into a vital marketing strategy deployed across all sectors of society, from corporate boardrooms to the halls of Congress. The burgeoning popularity of social media technologies has been a driving force behind Maxwell School Assistant Professor Ines Mergel’s academic research, inspiring her to explore how social media innovations are being adopted and utilized across the government sector on a daily basis. And in a new graduate course this fall, “Social Media and the 2012 Election,” Mergel is using the presidential campaign as a compelling lesson on how social media can be used in real time to shape messages, control crises, motivate donors, build support and engage citizens. The goal, she says, is to make students proficient in the use of those technologies and mindful of the ways they can be applied appropriately to the students’ own professional endeavors, whether they aspire to a career in the government, nonprofit or corporate sector. In Mergel’s class, created in partnership with School of Information Studies Assistant Professor of Practice Anthony Rotolo as a collaboration with his own undergraduate-level course “#ElectionClass,” students track candidates’ day-to-day social media activity; generate their own tweets and blog about the nominating conventions, debates and other campaign milestones; and, for a final project, devise a social media strategy for an organization of their choice. Along with Rotolo’s class, they also will host a series of guest speakers, helping them understand how social media lessons of the campaign can be applied to regular governing activities. 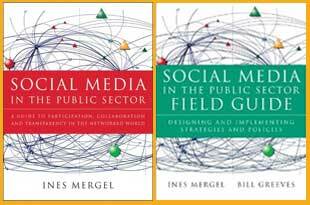 Mergel, whose book “Social Media in the Public Sector” and companion field guide are set for publication this fall, says that social media sites stand to gain even more significance as they take on functions typically associated with news organizations. In a partnership with USA Today, for instance, Twitter maintains an online “election meter” that tracks the candidates’ day-to-day popularity based on the number of positive or negative comments making their way through the twittersphere.